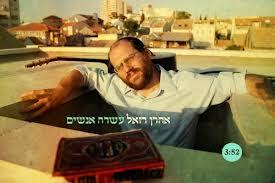 In Aharon Razel’s awesomely eye-catching new music video for the song “10 People” he searches all around Nachlaot’s alleyways and marketplace for 10 people willing to join him on his roof to declare their belief in Hashem. But he can’t find a single taker…until 10 Nachlaot boys agree to join him. Loved seeing so many familiar, young faces from around the neighborhood. Also, congratulations to my dear Netivot Shalom chavruta, Efrat, on her brilliant screenplay-writing debut with husband Aharon for this video! 🙂 English translation below. זוחל, אולי פצוע, פתאום מבחין: בַּצד עומד לו קיר רעוע. “נכנסתָּ לבית המדרש, מצאת מקלט בִּשדה הקרב”. לעמֹד אִתי על הגג ולצעֹק, ה’ הוא הָאלֹקים! שָׂבעתי הבטחות וַעטיפות בִּשלל צבעים. מתיַשב ללמֹד. “שלום עליכם”, נגש הרב, “מֵאיִן אתם”? זו שכונת מגורים, שכנים מבוגרים. סגרתי את התריסים. למה סְגַרתֶּם את התריסים? למה החלונות פה מכוסים? אז אנא פתחו שוב את התריסים”. Like a person running in the battlefield, arrows coming from all directions, he sends his eyes to Heaven, passes and slips between the whistles, he searches for a refuge to hide no matter what happens. He crawls, maybe injured, and suddenly he sees: to the side there is a shaky wall. And that’s what the rabbi once told me, closing the door behind him, “You’ve entered the Study Hall, you’ve found a refuge from the field of battle.” Seat yourself with a Gemara, it will shield you in times of trouble. Turn it and turn it, day and night contemplate it, because there is no wisdom and understanding without it. Outside there are winds and thunder, I asked for knowledge, I asked for the inside. I had received my full of promises, and wrappings in many colors. And he sits with his head bent in the heart of his room. If there is any trend, he will go against it. Poverty and silence all around. It’s possible to ask, but he doesn’t answer. “Listen to a moving story,” the rabbi said to me. “One day I began to worry about all the noise of the men who learn here. This is a residential neighborhood, and we have elderly neighbors. I closed the blinds and not an hour passed by and there were knocks on the door. Outside an old woman is standing a bit embarrassed but with a strong voice she asked me, “Why did you close the blinds? Why are the windows covered? Even though it’s difficult for me to walk, I pass by here every day several times. I am sick and I am no longer young, but there is no bandage or treatment better for me than to see you learning, to see you sitting and learning, so please open the blinds once again. Love the clip, but I am saddened that all the boys on the roof are charedi. what could possibly be sad about that?